Lyft drivers: make up to $500 Uber ride-share bonus! Uber sign up bonus: For a limited time, Uber is offering drivers of other ride-share companies, a $500 bonus to sign-up to drive with Uber. You just have to be able to prove that you started driving before 3/31/2015 for the other company (with a weekly pay statement, for example). 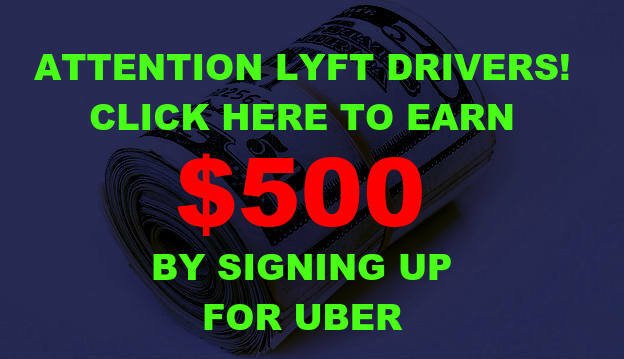 Attention Lyft drivers: Act now and earn up to $500! Up to $500 after you sign up to drive with Uber with this referral link. Lyft is offering sign-up bonuses in select cities. That means that if you use a current driver’s promo code to sign-up, you will get a cash bonus after you complete the required number of trips. Click here to use my Lyft referral code.